Sorry folks I am behind this week, I will explain at the end of this post. 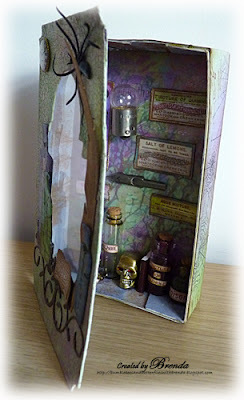 I have just noticed that Jean, at Crafty Individuals, has posted some Halloween projects including this box of mine. 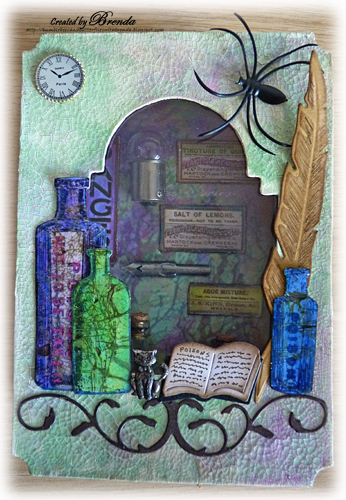 This is like an apothecary window made for Crafty Individuals using CI-360. I made the box using a Sizzix die and cut a window using the cabinet card die. Once made up I blended shabby shutters, peeled paint and seedless preserves over the top, heat set it and painted it with clear distress crackle paint. I also inked up some A4 card with the same colours and stamped it with TH cobwebs and CI text plate CI-161, which was cut into strips and used to cover the outside base of the box. For the inside I used CI background paper pad Book 4 - Trees and added some of the labels from the poison bottle stamp plate and other bits to make it look like a shelf in the shop. I finished by cutting out the bottles, inking them and covering them with utee. By putting them in the freezer for a while I was able to crack them and ink them with walnut stain to make them look really old. Some dies, a clock face, spider and a metal black cat covered with black paint finished the look. I hope you like my spooky fun box and please do go over and take a look at the other two fabulous projects made by the lovely Lynne and creative Daniele. I am sorry if I am missing your posts at the moment. Some of you have been keeping a close eye on the progress of my grandaughter. Last Friday, following what seemed to be a promising week for her, she had another set back and started being sick again. The doctors monitored her over the weekend and she had to have her stomach aspirated daily. Unfortunately she was in surgery again on Monday which resulted in another 6 hours under anaesthetic and she is now on a high dependency ward. The poor child has had more of her bowel taken away because they could see more Crohns developing and has had an incision that stretches right across her stomach. I can imagine she will be in hospital for several more weeks and of course we pray that the doctors have been able to eliminate all they need to and that the whole of her digestive tract will mend properly so that she will be able to get back to being a 15 year old teenager who can concentrate on her school work and enjoy life again. One of my dear blogging friends, Margreet, who lives in the Netherlands has offered to make her a card and I know it will be wending its way to me very soon. Thank you so much Margreet. If any of you who 'know' me would be able to do this I would love to hear from you (my email address is on my sidebar), I think it would cheer her up immensely to receive cards from different parts of the country and maybe from around the world. Thank you in anticipation. I hope I will be able to catch up with you all very soon, but in the meantime take care of yourselves and give all your family a big hug. With a hug from me to you. Oh my goodness, she is having a rough time. Hopefully things will now start to improve and she can get home again. Poor child. I'll send a card...I have your address. Your poor granddaughter - what horrible developments after such hopes. I'm on my way with an email to get your address. As for your piece - I saw it over at CI and loved it, so it's great to see some more details - thank you for sharing them, at a point when it must be the last thing on your mind. A 15year old should be having fun times with her friends and meeting boys and pushing the limits etc; giving mum a few Grey hairs, I am sure you and her parents would prefer these trials of growing up and not the trauma of operations and the like. But she is young, and there is hope that it will be better soon, even though she will not be able to indulge in fast foods, this will be a small price to pay for good health. I do hope she recovers quickly Brenda, I will send one of my special cards off to you today.... Tell her New Zealand is a beautiful place with friendly natives!!!! Your apothecary box is a fabulous creation with so much wonderful detail. Love it to bits. Oh Brenda your poor grand daughter what a terrible time I can only imagine what you are all going through right now. Your creation is just lovely by the way. I do hope your grand daughter is on the mend soon! Brenda, my heart goes outto you what a difficult time for you all, all you need to do is be with your family...we will still be here! Sending much lve , will email you so I can send a card! Hugs and kisses winging there way to you sweetiekins and bounds of positive thoughts and prayers for Becca. What trials and tribulations your poor family is currently enduring Brenda. My heart goes out to you all at this time. I will be willing her well and that the operation has a positive outcome. She has the love of you all keeping her strong and willing her to be well again. Your little box is stunning and I just love all the different elements which make it such fun to look at: inspiring. Oh, Brenda, I'm so sorry to hear the news. Please do send me your address as I would love to send a card. Your spooky creation is wonderful inside and out. Those bottles, in particular, are fantastic! It's not fun for your grandaughter or the rest of the family will be thinking of you all and sending healing hugs your way. Oh Brenda, your poor grand daughter is really being put through the mill, I hope she finds the path to recovery soon. gosh your grand daughter is sure going through it, I so hope that she is on the mend soon and back in the arms of her family, your project is totally amazing, just loving the skull and mini candle stick...... perfect. Missed seeing you at woyww this week, and thought something might be up--count me in for a card, will e-mail you. Brenda you grand daughter is having a rough time, hope all continues to go well after this last set back. Hi Brenda! I'm so sorry this is happening. I would love to send a card. Send me the address, and I will definitely keep her in my prayers. This is a wonderful project, and the fact that you made it with all the pressure you are under is amazing in itself! Oh Brenda, sorry to read these lines. Your granddaughter is really going through a rough time. Of course I'll send her a card. Your Halloween box looks wonderful. Brenda - I am so sorry to hear that your Granddaughter is suffering again, and at such a young age too - it just isn't fair. I wish her all the best for a full recovery - sending hugs to you and your family too. Great work on the scary box project Brenda - that huge spider freaked me out! 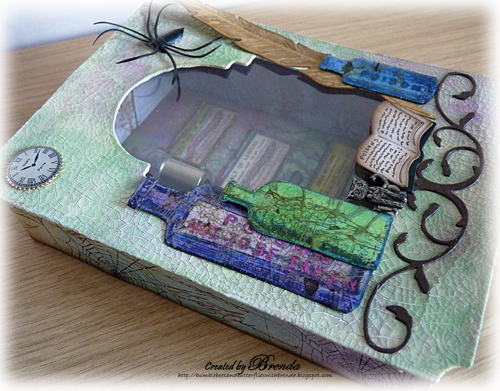 Wow, what a stunning apothecary box, Brenda...such lovely details as always...hope your post will bring much cards for Becca...I will send a new one shortly! 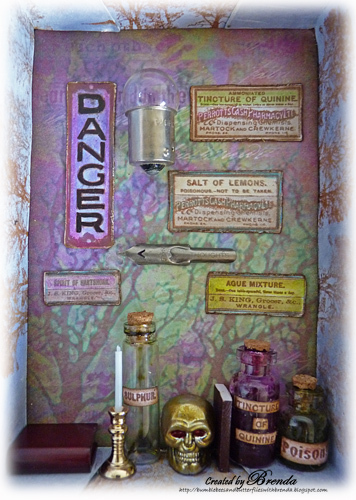 Brenda, this apothecary box is just what the doctor ordered! So many spooky details so perfectly executed! And that spider is so freaky! I am so sorry that Becca has been feeling so poorly again and having to go through another surgery! My prayers are for her to have that teenage life back and really soon! Poor kid! Thinking of all of you! Hugs!